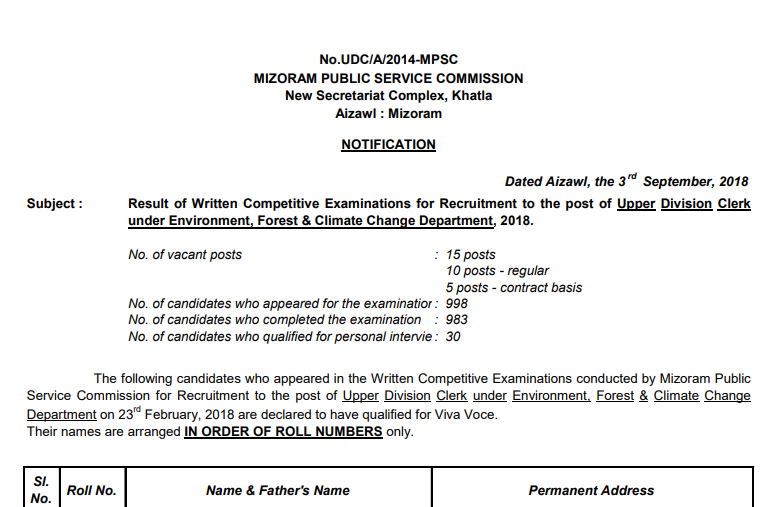 On 3rd September, the Mizoram Public Service Commission announced the result of the written examination conducted for the posts of Upper Division Clerk in Environment, Forest & Climate Change Department. The commission notified for a total of 15 posts (10 regular posts and 5 contract basis posts). A total of 998 candidates appeared for the examination out of which, only 30 candidates have qualified the examination. Those who have passed the examination will have to appear for the personal interview. The commission has published the list of qualified candidates in which names are arranged in order of roll numbers only. The list comprises of roll numbers, candidate’s name, father’s name and permanent address. The commission will pick the suitable candidates on the basis of written test and personal interview viva voce. The written examination was organised on 23rd February. Out of the total number of candidates appeared for the examination, 983 aspirants completed the examination. The personal interview is scheduled to be held on 12th and 13th September at 10:00 AM in the office chamber of the Chairman, Mizoram Public Service Commission, Aizawl. As it is a “personal interview”, candidates will be called individually. 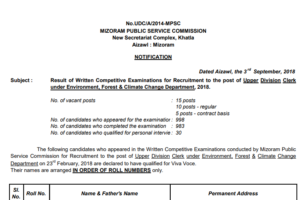 By 10th September, written examination qualified contenders have to submit the attested photocopies of the prescribed certificates to the direct recruitment section of MPSC. To clarify whether a candidate has qualified the examination or not, he/ she needs to open the internet browser and visit the official website mpsc.mizoram.gov.in first. In the top menu, a result section has been provided (especially for results). Candidates need to move on the cursor on it, it will drop down. Click on the “2018-19” link. A page will open where links of all the results released by the MPSC has been provided. After pressing that link, a PDF file will open which consists list of all the shortlisted candidates.